In functional medicine we have a few priorities with every single case of hormonal imbalance. Meaning, if we don’t sort these out first we will never get you and your hormones back in balance. And this is true whether we’re talking about optimizing your hormones with herbs and nutrients OR you are taking any type of hormone replacement (thyroid medication, estrogen, testosterone, any type of HRT, etc.). These priorities make sure metabolism of hormones is thorough and going down the preferred, healthier pathway (i.e. estrogen and thyroid for example), hormone receptors are spruced up and signally properly, inflammation is tempered (I call inflammation the Great Hormone Mess-Maker) and that your brain and hormone producing glands (thyroid, adrenal, ovaries, etc.) are talking adequately and that timing, output and rhythm of your hormones are optimal. I get it! We have a reductionist and over simplified model of hormones. We tend to think: hey estrogen is low, give me more of that! Or my thyroid numbers aren’t optimal let’s up my dose! Makes perfect sense except that what happens often when we do the knee-jerk-take-more-hormones-approach is that we feel better for a bit only to feel crappy again in a few weeks. OR we look at our lab work and feel like it must be someone else’s! We have all the symptoms of low estrogen, low progesterone, low thyroid, etc. but our labs look “normal”. 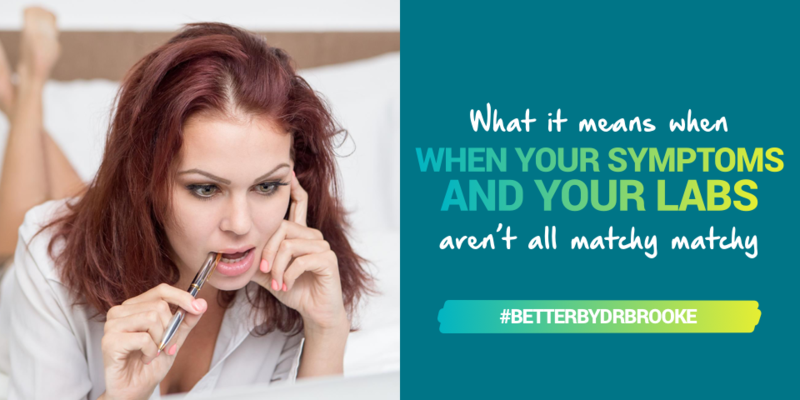 If you feel like your lab work is confusing, want to see the bigger picture or like you and your labs aren’t all matchy matchy then be sure you download my FREE Guide To Lab Tests For Women & Their Hormones. Ok so what can you do when it seems you, your lab work and your symptoms aren’t in synch? These four basic priorities will help you no matter what ails you and no matter which hormones (or all of them!) are out of balance – and to a large degree you can handle these on your own. I spend the bulk of the first month working with new patients on balancing their blood sugar. This is sort boring but almost always life changing! At least hormone changing. Managing blood sugar is so fundamental to your entire hormonal landscape it simply must be dealt with first as it corresponds to two of your most important hormones: cortisol and insulin. I cover finding your Unique Carb Tolerance in this post (using your symptoms) and in this post(using a glucometer). And I talk all about why insulin and cortisol are the two hormones I want you to focus on more than any other in this post and 10 Habits to help them right here in this post. When blood sugar is unbalanced, between meals or after meals your body will experience this as stress, the same as any other type of stress because cortisol is a key blood sugar regulator. Blood sugar swings also produce insulin surges which disrupt brain chemistry balance and raise inflammation – which in and of itself worsens hormone balance. So take the time to know what works for you in terms of carbs, fiber and meal frequency. Curious how insulin and cortisol are faring for you? Be sure to take my FREE quizzes and find out. Inflammation has many sources for us these days and if you’re a woman like me with PCOS, inflammation is a root cause of most of our hormonal trouble. I talk about that in this post. We need optimal essential fatty acid balance and to manage all sources of inflammation (stress, over or under exercising, eating food that doesn’t work for us, blood sugar spikes, lack of sleep, dehydration, etc.) to keep our hormone receptors happy – so that when a hormone is around it can bind to the cell’s receptor and have the action. An example might be that you have thyroid hormone around but it can’t bind properly the cell doesn’t get stimulated to do anything. Great illustration of lab testing being hormonal but you having low hormone symptoms. Inflammation also mucks up the works for many enzymes that convert and metabolize hormones which can create a host of symptoms such as estrogen dominance related ones including PMS, breast tenderness, weight gain, bloating and heavier periods. To improve inflammation be sure you are eating what works for you, avoiding any foods that fire you up (digestive symptoms, skin issues, headaches, fatigue, puffiness, joint pain, etc. ), get that blood sugar balanced, manage your stress and get enough sleep and recovery. You can also use turmeric and fish oils to help nudge things along. So this one you may need a little guidance from a qualified functional medicine doc as testing is often necessary to see what type of gut imbalance you have, if there are any infections to be cleared, if your gut is “leaky” (hyper-permeable) leading to inflammation, immune activation and more food sensitivities and how best to fix it. But it’s gonna be worth it because an unhealthy gut is a hot bed for inflammation, the hormone mess maker! And hormones like estrogen and thyroid have key steps in their metabolism that require healthy gut bacteria. What’s commonly called “detox” is the process your amazing liver does to toxins, endocrine disruptors (i.e. estrogen like chemicals in plastics and preservatives), your own hormones and a host of other chemicals. It takes one thing, transforms it into a water soluble thing (often more problematic) and then transforms that thing into a safer compound that can be easily excreted out via the digestive tract or kidneys. When this doesn’t work properly – or most importantly isn’t thorough and we get hung up at a more problematic chemical after that first step if step 2 is sluggish – we can get a host of hormonal and health issues. For example, in the liver we have a couple of key estrogen biotransformations that aim to ensure estrogen is metabolized to safer forms (2OH) vs. more troublesome forms (4OH and 16OH) and then that healthy gut from #3 scoots those metabolites out of your body. When this doesn’t work properly we have more estrogen dominant symptoms as I mentioned above and can be at risk for more estrogen related cancers and other issues. Curious about your hormone levels or how these key priorities are faring? You may need testing that is beyond a hormone level such as more thorough blood glucose assessments (HgA1c, fasting insulin, etc.) or markers of inflammation (i.e. hs-CRP). 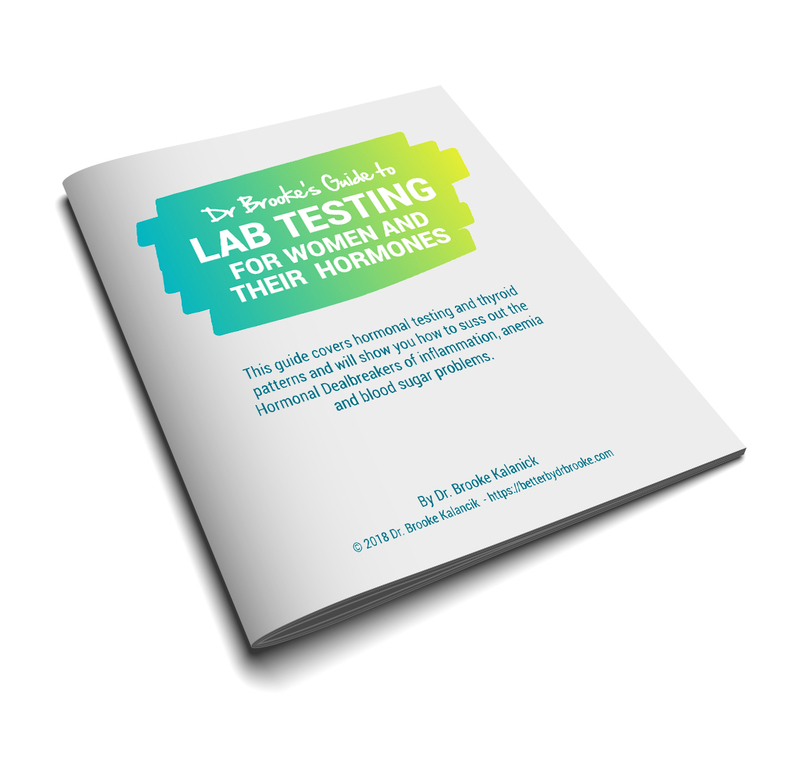 Make sense of all this and see what testing you really need by downloading my FREE Guide To Lab Testing For Women & Their Hormones. There’s also special BONUS material in this guide for women with PCOS!